Peter Derek Fry was born in High Wycombe on 26 May 1931. He was educated at Royal Grammar School and Worcester College, Oxford. He joined the Wycombe Young Conservatives in 1949 and the Oxford University Conservative Association in 1951. His first marriage to Edna Roberts was dissolved, and he subsequently married Helen Claire Mitchell in 1982. 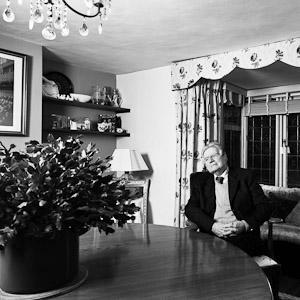 Fry worked as insurance broker and in his family retail business before serving as a Conservative councillor on Buckinghamshire County Council between 1961 and 1967. Fry unsuccessfully ran for Parliament in Nottingham North in 1964 and Willesden East in 1966, before being elected for Wellingborough in a 1969 by-election. He held the seat until losing by a small margin in 1997. Peter Fry died on 11 May, 2015. Click here to listen to the full interview with Peter Fry in the British Library. "When the Falklands situation developed and the fleet, well armada, was sent off, there was a great rumour that members of the Cabinet, including Francis Pym, didn’t want to go ahead with it, they wanted to do a deal brokered by the Americans or something, Margaret was very very upset about it, so I said to Fergus [Montgomery] there’s this rumour running around that that’s what the old school of the Cabinet want to do. He said ‘do you think there’s any truth to it?’ So I said, ‘I don’t know, you’ve been her PPS, you can walk across to Number 10 and find out’. So he did. He came back and said, ‘you’re right! What do we do?’ So I said ‘well, I tell you want, we could tell all our mates, and say they agree with us, tell the whips office that we shall all resign the Tory party whip’. There was no Cabinet revolt.... When the first ships started to get sunk, we were having an all night debate. And John Nott was the minister. And a notice went up on the board: statement, 10 o’clock, Secretary of State for Defence. So the place was crowded. I couldn’t get anywhere. In the end the only way I got anywhere to sit was to go up in the gallery, which absolutely overlooked the government benches, behind the Labour benches. And I sat there, and he came in, and Margaret sat next to him. This was a woman who some people said was mad, military mad, she wanted to go to war. And as he announced the loss of the first ship, she sat there weeping. I could see her. And then people had the nerve to say that she had deliberately done all of this. It just was not true. She felt it, she felt responsible. … It showed that she cared." Track 1 [00:35:09] [Session: 05 January 2012] Sir Peter Fry [PF], born in High Wycombe, 1931. Comments on how his parents moved from Liberal party to Conservatives, like a lot of prominent liberals and people from middle and lower middle classes. His father was elected Councillor in 1945 as an independent. PF’s father was made the Chairman of the Housing Committee and was responsible for the construction of council houses during 1945-1950. Story about people queuing outside his house for housing. [01:50] Description of the first political meeting PF attended at the age of 14. His brother in law took him to a Labour party meeting. PF admits he was quite strong Labour. Disappointed with the Labour party when they decided people could not take money to other countries as a tourist. [04:00] Comments on 1950 election and how this was the last time his mother worked for Liberal candidates. Only a rump of the Liberal party was left after the election and his father moved to a different ward. [05:25] Story about the agent for the constituency asking PF to join the committee after he had come down from university, at age 23, to help his father. PF helped in the county council election and in the next election he was himself the candidate. He didn’t expect to win, but did. He received a lot of votes from young people who had recently moved to the constituency. [07:43] In the County Council PF became the whip, the Secretary of the Conservative anti Labour group. At that time there were several Lords on the Council. [08:25] Comments about the decision of the Labour party to end the Grammar Schools. He proposed to the Education Committee of the Buckinghamshire Council that it exclude the existing selective schools from this measure. [11:07] Description of how the grammar school he attended had students from mixed backgrounds. [12:12] Comments on how the Conservative party fought for the grammar schools. [13:07] In 1951 PF went to Oxford after two years of National Service. In Oxford he joined both the Liberals and the Conservatives. Joined the Oxford Union. Story about Michael Heseltine being one of the brightest members in the Union. Mentions college life in Oxford and how it contributed to his interest in politics. [18:26] Mentions Rupert Murdoch who used to live underneath him in the college and was at that time member of the Labour party. [20:44] Comments on PF’s mother and how she was involved in political meetings and campaigns. Politics was a subject frequently discussed in PF’s house with the whole family. Mentions that in this period elections were interesting and the local town hall at High Wycombe was full every night for political meetings. Went with a friend to these; thought the conservative candidate, William Waldorf Astor, was very unsuitable for the constituency. [25:50] Comments on how politics was more lively in the those days and how people got involved in the debates and activities much more than today. PF mentions that the way national elections are run now takes away from the local constituency some of the strength it used to have. [28:11] Describes High Wycombe and local politics. [30:00] Mentions local philanthropist and businessman who turned out to be fraudulent. Refers to Jack Good(? ), very popular member of the local council. [31:35] Mentions his history master, Mr. Cave, as an inspiration as a teacher. PF considers him the person who influenced him more than anyone else. [33:43] Comments on how he was attracted to the Labour party in the beginning because of his reading about British History during 19th century and early 20th. But he was disappointed with the way the party conducted politics when was in the power. Track 2 [00:17:23] Comments about his school teacher, Mr. Cave, who had been a conscientious objector during the war, and the headmaster of the school. [01:17] PF mentions his mother was 40 years old when she had him after around 8 miscarriages. At age of 3 he developed mastoiditis and in those days there was no penicillin so the doctors had to operate. He can’t raise one side of his mouth as a result, which is not an advantage for a politician. He received every encouragement from his parents. His mother insisted he should go to a private prep school and then to a grammar school. [03:55] PF’s parents were Methodists since they met as teenagers. He used to go to Sunday school in the morning and afternoon and to the service in the evening. Religion was a major part of the family life. Discussion at school around 1945 election. However, thinks religion was pushed on him by his parents and now he considers himself at least partly agnostic. Comments that the Church of England was the conservative party at prayer; the Methodist Church had a more progressive attitude, much more turned towards the Labour party. In those days churches were social centres. [09:37] Comments on his experience of World War II. He was fascinated by the war and used to read papers and the magazine ‘The War Illustrated’. Story about seeing the flames from London because of the blitz. When he was 12 he had to hide in a shelter/bunker in Portsmouth with his family. Mentions some social work his family did during the war. [12:40] Comments on failure to get into Cambridge University, and success in getting into Oxford University, including entrance exam and interview with Asa Briggs, who mentioned his teacher, Mr Ashford. Refers to his experience at Oxford, joining Liberals, Tories and the Oxford Union and being in a college (Worcester) with public schoolboys such as Lord Lennox. Track 3 [00:56:36] Comments on his time after Oxford. He wanted to go to Law School, but thought it was not fair to his father. Needing an income, PF looked for a job and started to work as a management trainee in Liverpool, then returned home and worked for an insurance company and later began his own insurance broking business. [03:28] Discusses his role as whip for the anti-socialist group in the county Council. Mentions again how he saved the grammar schools and affirms this was the most important thing he did in his political life. [05:00] Comments on his two first attempts to get into the House. Secured a job as Conservative political education officer for London, which enabled him to get onto the candidate’s list and then apply for seats. The first seat was Nottingham North in 1964. [07:37] Mentions that the most important question he was asked in selection was “do you have an outside income?”: if not, you didn’t get on the candidate’s list. Remarks on professional trajectories of politicians. [09:02] Comments on the 1966 election, when he stood for Willesden East, and was the youngest candidate in the area. [11:39] Comments on the by election campaign of 1969 in Wellingborough, after the death of the Labour MP. PF got adopted at Wellingborough at the end of 1966 and worked for three years in the seat. [15:42] Remarks on the relationship between PF and the constituency and the party’s national leadership. Story about a speech given during the by-election by Enoch Powell and the relationship between them. Powell was a tremendous influence, but PF had moved away from Powell by the time he made the infamous “rivers of blood” speech and when he fell out with the party. [21:25] Comments on Liberal Democrats in Wellingborough and 1964 Election. [22:38] Comments on PF’s first election campaign and how it was financed: the Weetabix company based in Northamptonshire had been started by a Tory family which provided money; as a marginal seat there was also help from central office [25:18] Comments on local and national interests in his campaigns. The 1969 campaign was based on Labour’s failure. He tried to show his commitment to the constituency, even if he had to act against his party, in particular in connection with the shoe industry. Relationship with party whips. Shared rooms in the House with eight members after the 1970 election, including the future Duke of Buccleuch. [29:06] PF roped in as Secretary of the Anglo-Yugoslav group: comments on Yugoslavia. [31:15] PF regards his main contributions in Parliament to have been in the transport sector. In the Transport select committee he was the senior member of the Tory majority, when there was a Labour Chairman was Labour. He was part of the transport committee until after the dispute between the whips and Tory MP Nicholas Winterton over the Health Committee that resulted in the announcement that MPs were not allowed to serve on a select committee longer than 12 years. [34:23] Comments on his good relationship with Labour MPs and his admiration for Margaret Thatcher. Also mentions that Edward Heath was a disaster. Keith Joseph was brilliant but weak and had been ill. [37:05] Mentions Margaret Thatcher was approachable, Michael Heseltine on the contrary “always knew better than anybody else”. One of the great things about Thatcher was she tried to understand the problems of individual MPs and their constituencies: story about her help in influencing Norman Tebbit to ensure his constituency obtained an enterprise zone. [39:22] Says Michael Heseltine did a good job in Liverpool. [39:53] Stories about his friendly relationships with members of both sides of the House, especially based around pairing arrangements. Story about a speech in his constituency by Dennis Skinner. Comments on social life in the House. [47:20], close to (David) Gilroy Bevan, Terry Dicks and Ian Gow [48:40] Rumour at beginning of Falklands war about cabinet wanting to negotiate, and PF’s efforts to prevent it. Anecdote about how Margaret Thatcher broke down in tears in the House when being told of the loss of HMS Sheffield. [52:14] Remarks on his first speech to the House concerning a new pension bill introduced by the Labour party. [54:22] Remarks on the difference between discussion, speaking and voting.